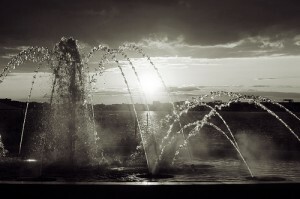 Cascade Fountains is comprised of the best design build fountain installers in the Washington D.C. Metropolitan region. Our personnel have over 20 years experience in the designing, and construction of premiere fountains all over the country. We offer an in depth analysis on designs, and work with architects and customers to ensure their visions are made a reality. Cascade Fountains will take an architectural design, and build the fountain equipment around what the design intent is. We will provide full detailed drawings of hydraulics, electrical, equipment layout, and sections in order to provide a better understanding of how a fountain is built. This enables the customer, or architect to fully understand how a fountain can be built to accommodate their vision. Cascade Fountains has a large commercial client base, but we also build residential fountains. Our fountains can range from a small front yard feature for a residence, to large commercial show fountains. If the project involves moving water, Cascade Fountains wants to be apart of it! Cascade Fountains #1 priority is customer satisfaction. We pride ourselves in doing great work. We will work with our customers to ensure they are happy with the end product, and complete training on how to operate/maintain the fountain. We have been praised by numerous customers, and that is what makes our job worth while.